Hello kiddies! A review of Tales From the Crypt: The Board Game. 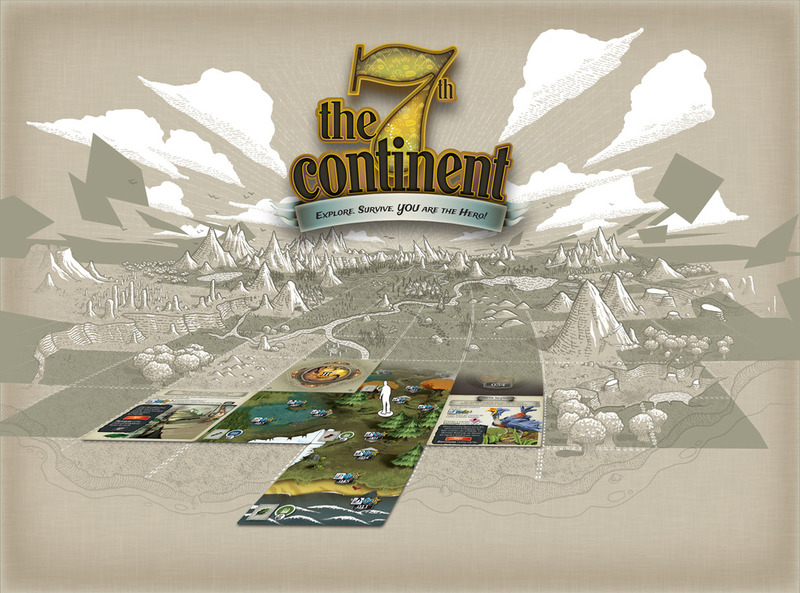 There have been a lot of reviews written and recorded talking about The 7th Continent. The trickiest part about writing a review for The 7th Continent is conveying an appropriate sense of what the game is without revealing spoilers. And boy oh boy, The 7th Continent is full of spoilers. Almost every single card is a spoiler of some kind, so sufficed to say, this is a tricky game to review. Most reviews try to draw parallels and comparisons with other known games as a way of dodging the spoilers. Where most reviews fail I think, is in explaining what it is about these comparable games that makes The 7th Continent good. A Song of something, something, something. Myst, Time Stories, Choose Your Own Adventures, and Fighting Fantasy. Those are all games that The 7th Continent draws inspiration from. Imagine Myst set in a world that was truly alive and was moderately coherent. Imagine Time Stories without some jerk named Bob, all the crappy dice rolls and convoluted shield chits. Imagine a Choose Your Own Adventure or Fighting Fantasy book spread out over 1500 playing cards. The 7th Continent is all of those things, but it somehow manages to be something completely different. The 7th Continent is a card based Rube Goldberg story telling machine with a thousand little moving parts and nary a dice roll in sight. The narrative of the 7th Continent manages to be more complex then what you can expect from ANY of the games I’ve mentioned, however, the open ended nature of the game, by necessity, is never as personal a narrative as what you would experience in an “on rails” story like what you’d find in a game like Final Fantasy 6 through 9 or even a D&D module. Each game of the 7th Continent is an ever expanding flow chart of decisions that fan the plot out like a ren fair charlatan splaying out a deck of Tarot cards. The narrative is deep and complex, but it is never one that feels personal to the player. It isn’t a bad thing per se, but it can be a source of disconnect for some members of the audience. I don’t want to tell you what the story of The 7th Continent is all about, but I do want to convey an honest expectation of what you can expect. The tone of The 7th Continent is lifted directly from EC Comics Classic Tales From the Crypt series that ran in the late 1940s and early 1950s. Fans of TFtC and EC Comics’ other lines of weird tales will find a story that is lovingly crafted for their tastes. Most folks not familiar with the original comics may be confused to hear this comparison, especially if they are only familiar with the TV show adaptation of TFtC. The 7th Continent’s authors lovingly capture a sense of Mystery, Adventure, Horror and the occasional twist that were staples of a good EC Comic. Film audiences are no doubt familiar with Alfred Hitchcock or any number of his modern disciples like Steven Spielberg, Brian DePalma, David Ficher, and M. Night Shyamalan. The narrative of The 7th Continent FEELS like it belongs in the pantheon of works of these great modern storytellers, many of whom of course were also influenced by the EC Comics’ classics. The 7th Continent relies heavily on the sense of unknown lurking around every corner. Sometimes that strange noise is a cute little bunny. Sometimes you are going to face that cheap scare with the dead body popping out unexpectedly. The uncertainty and sense of wonder permeating every pore of The 7th Continent is an intoxicating elixer that will draw you in, no matter how many times you get bit. The 7th Continent layers 3 game types, one upon the other. You have at the game’s heart, a spacial exploration puzzle/riddle(s). You are moving around on the map, exploring, and looking to solve your “curse” which is a specific story driven puzzle for your character to solve. On top of this you have a hand & inventory management game that is probably the least original part of the game engine. You manage you gear that slowly breaks down so that you can complete various tasks and skill checks you come upon while exploring. 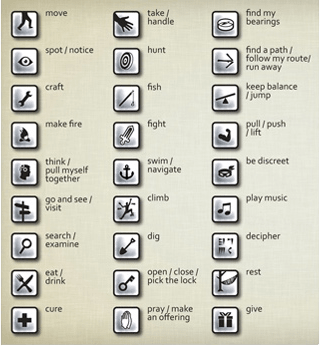 Even though this part of the game isn’t very creative, the choices are many and are often quite difficult. The final, and most pressing layer of the “game” in The 7th Continent is deck management. While almost everyone has heard of hand management games, I’m often surprised at how few people know what a deck management game is or how they work. These types of games are typified by the classic Star Wars CCG from Decipher (way back in the 1990s). In this game, your deck was your life force. Run out of cards in your deck and you die. One of the keys to winning SWCCG was managing how much of your deck you would use. Put out too many cards and you ran the risk of running out of cards and losing. Put out too few cards and your opponent could kill off your characters and you’d be easy pickings. Skilled players would cultivate the ability to know how to burn through their deck in the most efficient manner possible. The 7th Continent requires you to do exactly this as well. This is done through carefully deducing how and when to take actions that will burn through your deck, AND by deciding how to develop your characters’ inventories. You want your inventory to combo with the challenges you are facing so that you can reduce the rate of attrition your deck must endure. Fortunately, the game is quick to teach you how to refresh your deck with discarded cards. The methods of restocking your deck always make for entertaining side adventures (which I don’t want to spoil) and can break up the exploration portions of the game. The big downside to the game play in the 7th Continent is that it becomes VERY long winded. The pacing of the game can be quite slow and arduous. In my first campaign I thought I was drawing close to the end of the adventure only to learn that I had to complete some significant back tracking to obtain items I had skipped intentionally in an effort to be efficient in how I burned through my deck. This extra back tracking added HOURS to my game. This isn’t to say that the game becomes tedious or monotonous, but you should have honest expectations to spend hours and hours spread out over multiple gaming sessions. This is NOTHING like Times Stories where you can complete a single adventure over a 3 hour game. Expect to spend well over 10 hours on just your first campaign of The 7th Continent (assuming you don’t die). So yeah, The 7th Continent is a game that runs long. 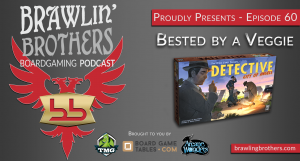 It was incumbent, of course, on the designers to figure out how to save the game between game sessions. 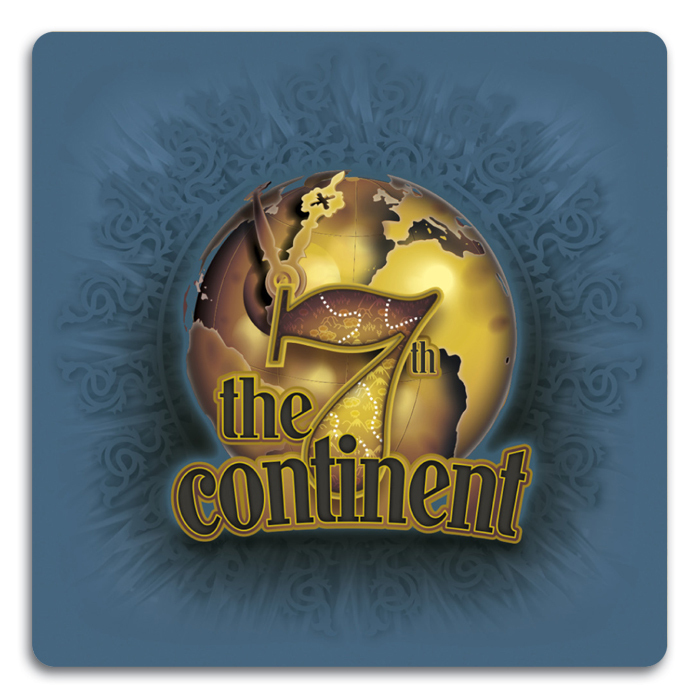 Perhaps the most remarkable thing about The 7th Continent is what they came up with. You can throw all the positive catch words from game reviews you would expect. Elegant, streamlined, polished, satisfying, and they all work to sum up the save feature in The 7th Continent. Its amazing to me that you can save a game to a saved state or set it back up in less then a minute. Having a good save system is excellent for all the obvious reasons, but it does create some odd quirks as well. Saving your game can, and often does reset certain game states and actions you might have taken. For example, I could decide to break a vase, go to a neighboring location, save, and when I return to the game, the vase will be miraculously repaired. Sometimes the game does a good job of preserving the choices and state of the world when you save, but other times it does not. Another interesting “bug” is that you can abuse the save feature to avoid certain encounters you may come across. The Devourers and weather based events (which are not spoilers since they each have their own expansions) can be removed from the board simply by saving. It isn’t completely game breaking, but it has plenty of unintended consequences and there are even a couple of rare skill cards that can combo off of this save function exploit. There are a lot of funny little rules in The 7th Continent, and the rules book does an acceptable job of teaching them. 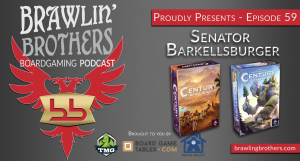 There are some MAJOR rules that are difficult to grok from reading the rules, so I would STRONGLY encourage you to watch the official rules video from the designers. The video runs a bit long, but it will teach you the trickier concepts much better then simply reading the rules. I found myself still not fully grasping the rules for the first few game session I had and found myself regularly referring to the rules. Most rules problems clean up though with time and practice. There are plenty of times, even now though where I find the rules to be quite lacking. In fact, I’m still not 100% sure how “food” items are added to your inventory. Most of the time now, I’m simply happy with the best educated guess I can come up with. I have found myself more and more willing to play loose with the game’s rules just because I want to tweak the experience to minimize the rougher and more frustrating points in the game. I would equate this to what many of us did with Choose Your Own Adventure Books when we were kids. I would dog ear the page where I made a given choice, and if things went south I could always “rewind” to the given page I marked. Stuff like this will happen in The 7th Continent too. You’ll occasionally mulligan stuff, or rewind choices and even whole turns. Its not a big deal IMHO to do this, especially given how weirdly opaque the rules can be at times. Don’t split up the party! Optimal strategies are a point of frustration any time they come up in a competitive game, but they are often overlooked in evaluating story driven cooperative and solo games. 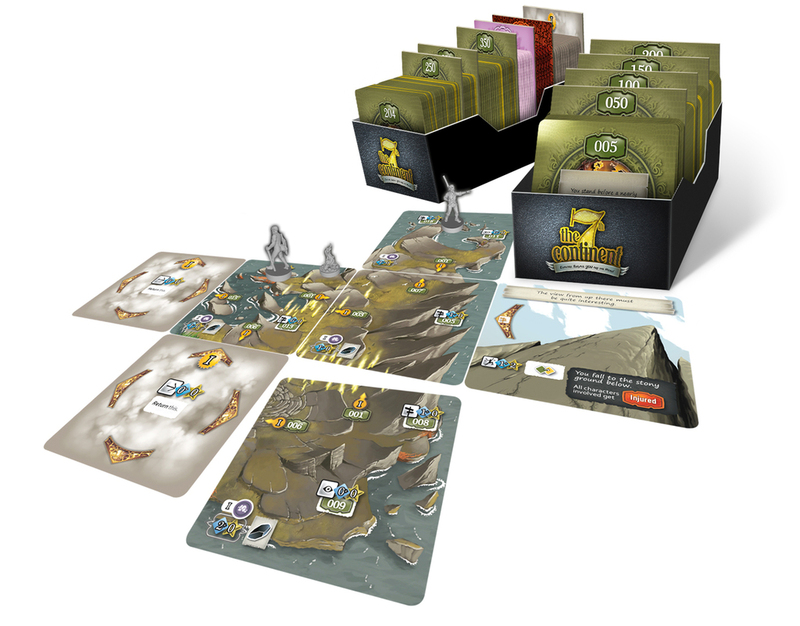 The 7th Continent does have a number of dominant strategies. First, the game plays best with only 2 adventurers (and typically this would be done by a single player). Having only 2 PCs means you’ll not dilute the action deck with extra unusable cards, but you’ll have the ability to team up your characters and have large enough hand sizes. There are even 2 adventurers in particular that work extremely well together. In fact, I would argue that these two characters have objectively better ability cards then other PCs you can choose from. At almost no point in the game does it make sense to split up the party. Having your two characters stick together only occasionally results in getting doubly punished, and even then the negative results are often easily fixed when you have both players present. Only when you have fetch quests in two different spots in opposite directions would this make sense, and such a situation is rare. I quickly found that almost every action I would take would involve both characters and I would only have to figure out who I wanted to be the “lead character” for the test. 90% of the time, whoever you choose to be the lead character doesn’t even matter. Once you get to know the cards in your deck, you will start to build the same combos of cards time and time again. You will feel like there are optimal card combos which become somewhat automatic. Eventually you will start to level up your characters by adding new cards to your deck. These new cards offer some limited strategic growth as well, but because the new cards are relatively infrequently added to the deck, the game can occasionally grow stagnant and you may feel a routine start to set in. This isn’t game breaking, but it is something you are bound to notice after several plays. Normally, these sort of loop-holes in a game would bother me, but I’m actually quite ok with this. Like I said before, the more you play The 7th Continent, the less obligated and bound to the rules you will feel. I’m sure there are plenty of smart folks who will say this is a bad design. My rebuttal would be that any designer that encourages (intentionally or not) players to have fun bending the rules of the game has a healthy philosophy of game design because they are acknowledging the real purpose for gaming. H. P. Lovecraft and Victor Frankenstein are player characters in The 7th Continent. Let that marinate in your noggin for a moment. The game is set in 1907 and that doesn’t work for either Lovecraft or Victor. Worse yet, Frankenstein’s character is a weird amalgamation of Victor Frankenstein and Frankenstein’s Monster, which, contrary to what the unwashed masses may think, are two separate characters. Neither character fits and it breaks narrative immersion to anyone with knowledge of the subjects. Further confusing things, The 7th Continent cannot reasonably be described as being a Gothic Horror or Cosmic Horror genre game. It falls instead squarely into that EC Comics fusion of Weird Horror and Pulp Adventure. Granted Lovecraft does cross over into Weird Horror, however, The 7th Continent is decidedly not a Lovecraftian tale. 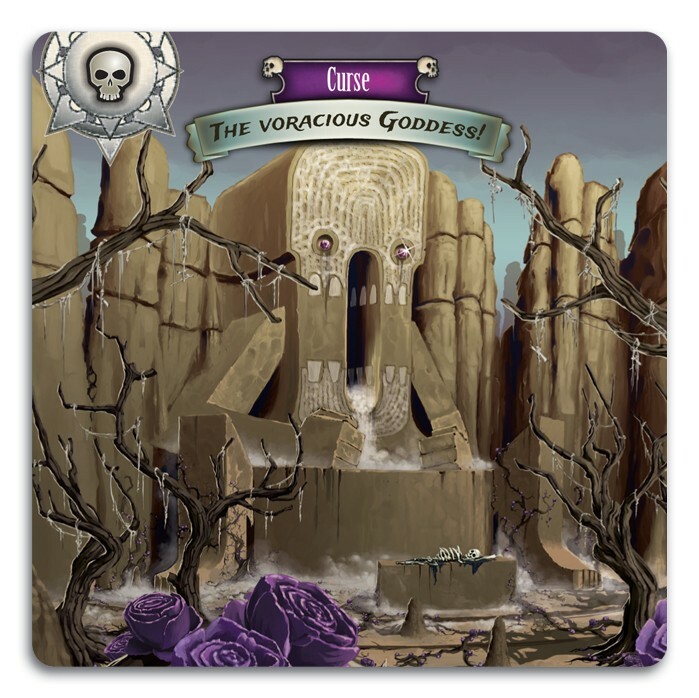 There is nothing about The 7th Continent that hearkens to any of Lovecrafts main horror themes aside from a rare event card or two. My feeling is that these two characters are junk fan service characters which don’t fit the narrative and are worthy of tossing out. The main reason they are even included is that they are a part of the public domain. I am also frustrated by the lack of art on some of the cards (generic curse cards I’m looking at you). I realize that corners had to be cut somewhere in a game this large, but it feels like an obvious missed opportunity to have giant patches of blank space on some cards. It could have been as simple as adding some rudimentary line art (see Robinson Crusoe). In a game that has unique art for every possible negative condition you can come down with, these virtually blank cards come off as lazy and cheap. As it stands, there are plenty of cards that stand out and feel like prototype cards. The 7th Continent is an amazing accomplishment in game design. The team set out to make an impossibly large and complex narrative game. That alone is a recipe for disaster. Not only does The 7th Continent avoid being a disaster, but it manages to become perhaps the most compelling argument in favor of board games as works of art. Epic, immersive, and frequently action packed, The 7th Continent has built a massive monument upon the shoulders of game design giants. It is a remarkable improvement on prior narrative game designs and will likely serve as inspiration for a generation of new and exciting games to come. The sheer volume of game content found in this box is such that even now I don’t believe I can fully understand it. The 7th Continent feels like a $200+ game and if you are willing to put it through its paces, you will come out way ahead on the deal. The 7th Continent is an accomplishment in design that we are unlikely to see repeated any time soon. Do yourself a favor and get your hands on a copy of this game. Not only is this a leading nominee for my game of the year, but I think it might rival many of the nominees for such honors in recent memory. Clear off your calendar, you’ve got a date with an instant classic!